The Walter Wickiser Gallery in Chelsea, New York City has signed with Nolan Preece for a solo exhibition. The exhibition will run the month of September, 2018. 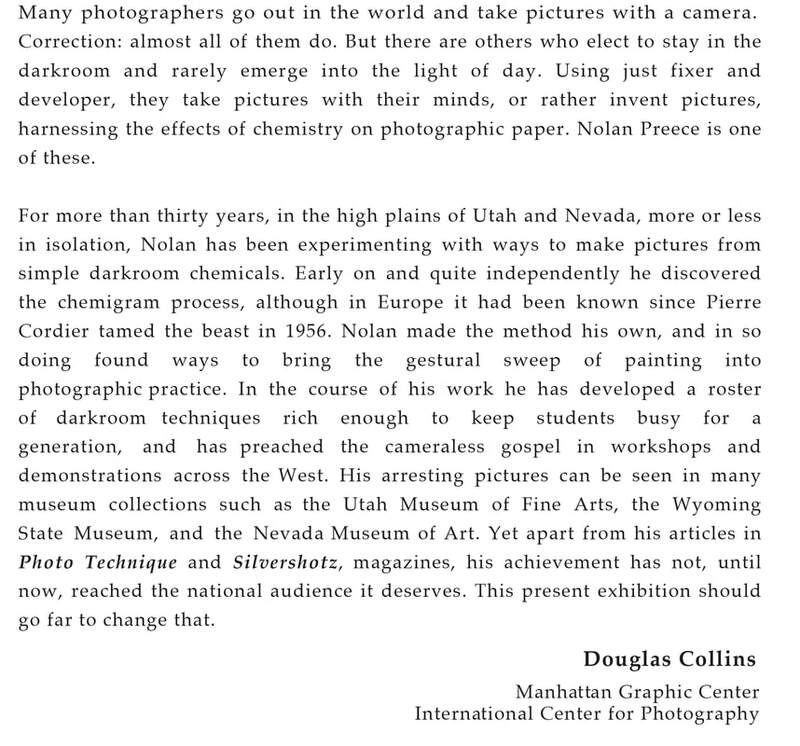 The 2018 Photographer’s Rendezvous is featuring Nolan Preece as the keynote speaker for their annual event in October, 2018 at King City, California. Nolan Preece is now represented as a gallery artist by Stremmel Gallery, Reno, Nevada and the Walter Wickiser Gallery, Chelsea, New York City. Check http://www.nolanpreece.com for more information. ​Craig Huber 2017's Guest Speaker. A Perfect Marriage – Alternative Photographic Process and the Book Arts. Following a meeting with Meg Partridge (Granddaughter of Imogen Cunningham) to view the stunning 21st Editions volume Imogen Cunningham: Platinum and Palladium, I decided to create such a volume to present my work on the California Missions (was published in 2015 the same year I made my first sojourn to Australia). I was so struck with the beauty of the land and the thriving alternative/historic photographic arts community that I embarked on a project to create a handcrafted volume showcasing the work of practitioners from this active and growing community. Combining handcrafted fine art alternative/historic prints, the written word, and artisan book fabrication creates the opportunity for a perfect marriage – one communicating a rich experience through sight and texture. Craig Alan Huber is a Washington state-based photographic artist who is largely self-taught, having begun with photography around the age of 8 with a borrowed camera from his father. While all the other kids were making pictures using new color films from Kodak, he was out with black and white film discovering patterns and textures. Removing the dimension of color and working with shades of grey, textures, and forms/shapes presents a unique challenge and offers new possibilities for him to this day. 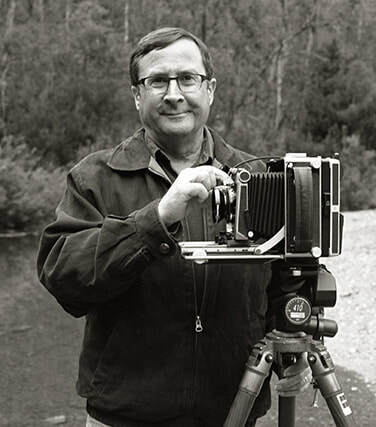 Since 1997 he has worked primarily with large format view cameras ranging from 4x5 to 11x14. A view camera affords him the ultimate in composition flexibility, and obliges a methodical working process that resonates well with the images that he is compelled to make. Working in a traditional wet darkroom with wonderfully large negatives, he hand-crafts prints in gelatin silver or platinum/palladium, depending on the aesthetic best suiting each image. Craig explains his vision “I feel a life force flowing through what I photograph. This unseen energy has a Spirit. It is this Spirit I try to capture and reveal through my work. During my photographic pilgrimages, the Spirit often ‘calls’ to me as an embodiment within the physical artifacts before me. The ways this ‘Spirit Within’ manifests itself are myriad, but often takes the form of vestiges and the events that occur during these sessions. I recognize that this entity transcends the dimensions that we deal with every day when using our five senses. National Steinbeck Center, Stanford University Special Collections, UC Berkeley Bancroft Library, the Basilica of Saint Mary, Mission San Antonio de Padua, the Museo de Fray Junípero Serra in Majorca, Spain; and in private collections throughout the US, Europe, and Australia.